You started your own business because you wanted to enjoy the freedom associated with being your own boss. You craved the fulfilment of doing work that matters. Perhaps you hoped to be there more for your family and friends. Maybe you were dreaming of exploring more of the world or pursuing other hobbies and interests. But now, you’re just feeling totally swamped by the daily grind, constantly juggling a gazillion things that life throws at you, feeling exhausted, wanting to make a change but not being able to see how. It’s a new year and time for a renewed you. If you’re dreading the idea of setting New Year’s resolutions because you’ve tried them and they didn’t work for you, or they just don’t appeal and you’re open to new ideas that actually work, then you’ve come to the right place! 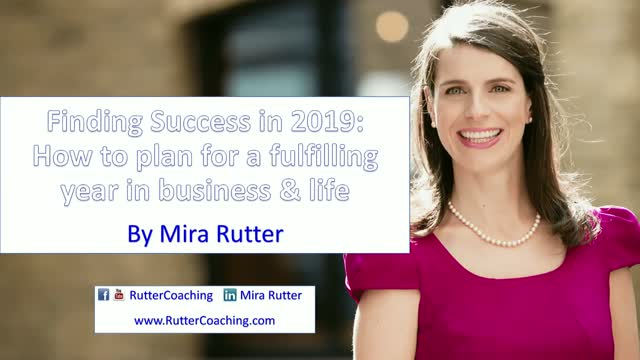 Mira Rutter, a Work-Life Balance Coach and Strategist, will share with you her top insights and practical tips on what you can do to achieve more balance in your life by focusing on what’s important to you and freeing up time and energy for what truly matters. Her proven eight-step strategy to leading an enriched, fulfilling and healthier lifestyle. This webinar is for you, if you want to create success on your terms by living a life you love while doing work you love without burning out.